Before the construction of the football carpet field, it is levelled with work machines, then the molds are laid and the construction bars are put and the concrete is poured as needed. Football carpet field iron construction should be constructed at a height of at least 6m. Besides the cost of iron construction, the cost of painting green as khaki green should be considered. For indoor carpet areas, the tarpaulin costs should not be forgotten. The surrounding of the football carpet field should be installed with PVC coated with 3.5mm thick and 5x5cm mesh wire. The cost of the ceiling net which is made of parachute rope with 15cm mesh gap should also be remembered in the cost. 400W halide projectors are generally used for football carpet field lighting. 100 W LED projectors can also be used as an option. But the cost is higher. 4X4NY cables and fuse box are also part of the cost. Football carpet artificial grass cost varies according to synthetic turf model to be selected. 55mm artificial turf is recommended. But 50mm, 55mm and 60mm models are also available. Standard models are knitted from fibrillated yarn and monofilament yarn is used in new generation carpets. Prices of all models are different. 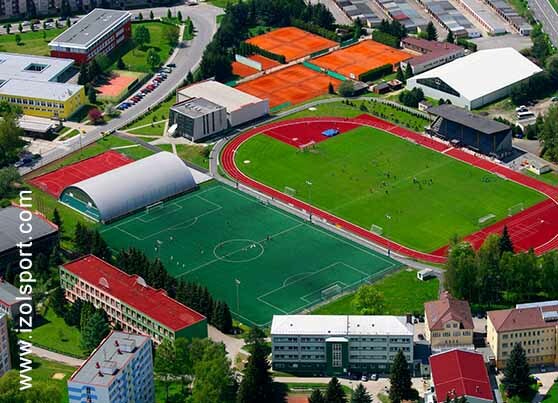 “For the social facilities”, the cost of dressing rooms, toilets, showers, canteen and one office room are also important in the construction of football grass carpet field. In addition, levelling ground, paving stones and landscaping should also be done.